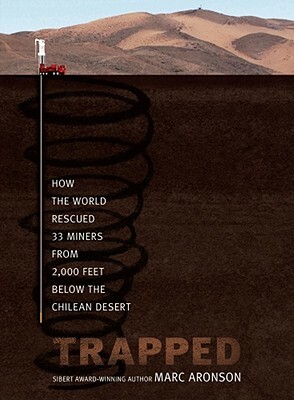 Trapped: How the World Rescued 33 Miners from 2,000 Feet Below the Chilean Desert by Marc Aronson. Grades 4-10. 134 pages. Review copy provided by my local library. When a cave-in trapped 33 miners 2,300 feet below the Chilean desert, it took a team of experts from around the world to bring them home. This is their inspiring story. Marc Aronson weaves the story of the miners, carefully keeping it taut with tension. I knew the basic information about the mine rescue, but this play-by-play gave me a lot of information that I didn't know. Mr. Aronson includes additional information about mines, geology, and a host of other things. While this was certainly educational, it is all included in the beginning and I admit skimming this part to get to "the good stuff". It may be useful for kids researching the mine disaster, but it may lose kids who are just interested in the disaster and rescue. After I read this book, I tweeted, asking "Can Marc Aronson write all kids' nonfiction?" Of course, I don't really mean that. There are many very talented authors of nonfiction for young people. But it's true that Marc Aronson's back matter makes my heart skip a beat. He includes everything I was looking for: a timeline, a list of the miners, a glossary, source notes, a bibliography, web sources. The book contains many photos, including a section of color photos in the center. Best of all, he includes a note about his research for the book, different than research for some of his other books since the topic is so recent. While he was working on the book, no other books had been written on the subject. Mr. Aronson talks about using the internet for research and how to dig deeper and develop the right questions to find the information you're looking for. This book will have a great deal of appeal for kids who followed the event as it was happening. It's also a great book about cooperation and a world community coming together to do good. It'd be great in a social studies unit about researching current event. Check out another review at A Fuse #8 Production. Trapped is on shelves now! Happy Nonfiction Monday! Check out this week's roundup at True Tales & A Cherry On Top!